It would be another lonely night. The door of my car thwacked as I closed it and I headed for my condo. I was a thirty year old single woman, a paralegal spending all day typing court cases and I had enough of meaningless parties and relationships. There were no real men anywhere to be found and feeling sorry for myself I was pissed-off with the world. Then I saw something in the walkway in front of me that made things even worse. “Hey, stop that!” I yelled. This guy named Austin was bending down and giving something from his sandwich to Fluffy my cat. During the past two days Fluffy seemed to be having stomach problems and his diet needed control. “That’s my cat and I don’t want you to feed him,” I exclaimed. “What do you mean? It’s not your cat. It’s mine,” he countered with a grin. I’d never met Austin but at a recent condo event he had caught my interest and someone had told me his name. “No way!” I asserted walking quickly down the walkway in Austin’s direction. “That’s not proof because I’ve had him for three months.” Still smiling, he seemed amused while the cat was slinking around his leg. Austin put the rest of his sandwich in his mouth, chewed and swallowed. “You don’t need to show me anything. I can show you if you follow me.” My anger was rising because Austin seemed to be enjoying our argument. “Okay, Ms. Cat Owner, let’s go,” he said. In a quick movement I reached down and picked up Fluffy before Austin could get to him. With Fluffy cradled in my arms I walked in the direction of my condo. We didn’t speak and I was beginning to feel foolish. Here we were arguing over a silly cat, but indeed the cat was mine. I had been feeding him for three months, in fact with very expensive cat food. Now Austin made this audacious claim that the cat was his. I would demonstrate that he was wrong. We walked through the large condo complex where I was renting one at the far end. Most residents were young, single professionals, but everyone was so busy we hardly ever had time to talk with each other. We came to the door of my condo, I opened it and we stepped inside and then I put the cat down. He began to weave between our legs, gently rubbing his back against me and then against Austin. Usually when other people came to my place Fluffy would disappear, so this behavior was strange. We walked through the living room, past the kitchen and then into a small hallway that led to the back door. “That’s where he sleeps,” I pointed at a basket in a corner with a pad in it. “Sorry to break the news to you, but he sleeps on my bed,” Austin chuckled. “Impossible,” I stated, and all of a sudden I had doubts. Fluffy was a stray that showed up at my door three months ago. 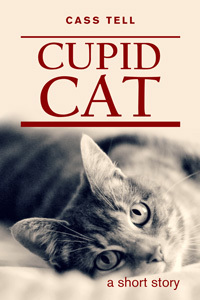 He had this heart penetrating meow that stirred pity in my soul. I took him in and fed him, but had to admit that often he went out by night. “Maybe he’s cheating on you,” Austin laughed. I was surprised to find myself enjoying his humor and maybe Austin was telling the truth. I was curious to find out more about it, but I found myself being more curious about Austin than the cat. I took a bottle of California Chardonnay from the refrigerator, a cork and two wine glasses. Before I could open it Austin said “May I?” And without waiting for an answer he took the cork screw and bottle from me, opened it, and poured wine into the two glasses. We went into the living room and sat on opposite ends of a long couch. Fluffy followed us and hopped up on the couch between us and started to purr. “I see that Tiger likes it here,” Austin said jokingly. “Quit calling him that. His name is Fluffy,” I chuckled. “It’s more descriptive than gender specific,” I said rolling my eyes to him. “You’re emasculating the poor thing,” Austin smiled. I liked the way Austin’s eyes twinkled. Our conversation centered on Fluffy’s peculiarities, like two parents talking about their child. Then we talked about our work, our backgrounds and our wishes for life. Austin was a good listener and it was easy to share with him. At one point I reached over to pet the cat and ended up stroking Austin’s hand which was scratching Fluffy’s neck. I didn’t realize what I was doing until I looked down and felt embarrassed. It seemed like our conversation would never end and when the bottle of wine was finished Austin left. Before leaving the best thing he did was ask me out and that began the most wonderful romance you could ever imagine. Six months later we were married and I moved into Austin’s condo which was much bigger than mine. One night we lay in bed and I suddenly noticed Fluffy there perched on a dresser. He was looking at us and I wondered how long he had been there. Fluffy seemed to have a smile and I imagined he was happy to see us together. I smiled back at him, knowing that he was the reason that Austin and I had met. Then he squeezed out the slightly open window behind the dresser and disappeared. I didn’t see the cat for three weeks until one afternoon I was coming home from work and I saw Lily one of the condo owners. She was running down the walkway. I turned the corner and saw her approach Jacob, another resident at the condo. Fluffy-Tiger was gently slinking between their legs. And then I laughed to myself realizing what Fluffy was doing.